The “DMI-006-001” module is an identification module intended to be housed in a switch box. A module for connecting 6 push buttons associated with any command. The response from the module is in real time so there is no loss of address. 2 black wires: non-polarised bus. 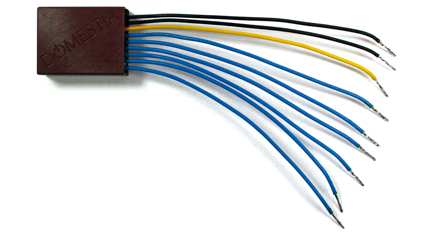 6 blue wires: free of polarity inlets. Size: to be housed in a switch box.